We suggest using the Ethiopian Airlines flight ET501 departing from Washington, IAD on September 17 at 11:00 AM that arrives in Addis Ababa (ADD), Ethiopia at 7:15 AM on September 18. Welcome to Ethiopia! Upon arrival at Addis Ababa Bole International Airport, we will easily secure our visas and be welcomed and assisted by our tour guide and driver before being transferred to our hotel. We will have time for a short rest in the morning, and in the afternoon start our city and sightseeing tour of Addis Ababa, which includes the National Museum, Ethnographic Museum and Merkato. Enjoy lunch this afternoon. Addis Ababa, founded in 1886 by Menelik II, is situated at 2,500 meters (8000 ft.) above sea level. It is the highest capital city in the world, after La Paz and Quito in South America. Only 9 degrees north of the equator, the city enjoys an excellent climate all year round, with an average temperature of 25C (77F). With a multi-ethnic population of over 5 million, Addis Ababa is a pleasant city with wide avenues of jacarandas, interesting museums, and one of the largest open-air markets in Africa, known as the “Merkato”. The National Museum of Ethiopia is one of the best museums in quality and diversity. Archaeological exhibits include the 3.5 million-year-old fossil of Lucy (or Dinkinesh – ‘thou art wonderful’- in the native language), a humanoid woman of the specious of Australopithecus Afarensis. The discovery of Lucy’s fossil in 1974 forced a complete rethink of human genealogy, providing that our ancestors were walking 2.5 million years earlier than had been supposed. The National Museum also contains many wonderful artifacts dating back to pre-Axumite civilization. In the morning, fly to Bahirdar. We have an arrival transfer then check in to hotel on the shores of Lake Tana. Walk around the beautiful town of Bahirdar and visit the bustling local market. In the morning, we will take a boat cruise over Lake Tana to visit the ancient 14th century island monasteries of Lake Tana. The 37 islands of Lake Tana shelter twenty monasteries-surviving remnants of an old, contemplative tradition. Because of their isolation, they were used to store treasures and religious relics from all parts of the country. The Lake’s monasteries are famous for their typical Ethiopian religious paintings, illuminated manuscripts, and other ancient church treasures. The monasteries that we are going to visit include Kibran Gebriel, Ura Kidane Mihret and Azua Mariam. After breakfast, drive towards Gondar, passing through the beautiful countryside scenery, arriving around midday for check-in. After lunch, explore the ancient city of Gondar. It was founded by Emperor Fasiledas around 1635, and is famous for its many medieval castles. The design and decoration of its churches, in particular Debre Birhan Selassie, represents a masterpiece of unique Ethiopian School of traditional art. After an early breakfast, we will drive towards Axum through the Simien Mountains National park. En-route we will be visiting the “Felasha” or the Black Jewish village. It is believed that the “Felashas” settled in this village during the time of King Minlik I, the son of the Queen of Sheba and King Solomon. When driving from Gondar up to Simien Mountains National Park, nothing prepares you for the spectacular scenery that awaits you at the top of the massif. The rolling grassy plateau comes to an abrupt stop, and sheer cliffs plunge almost vertically for 1,000 meter (3,280 feet) to the plains below. The massif itself has been sculpted by 30 million years of up thrust and erosion into a wonderland of jagged ridges, pinnacles and strangely cropped conical mountains. Looking out over the heart-stopping precipice, you feel you might just be at the edge of the world! After breakfast, continue to Axum through the beautiful sceneries of Simien Mountains, Limalimo and Tekeze River Gorge. After breakfast, we will begin the visit of the ancient city of Axum. This is the birthplace of Ethiopian civilization. By the first century, Axum was a major trading center for exotic goods from Egypt, Rome, Nubia, Greece, Syria, and India. It is believed that the Holy Ark of the Covenant was brought here before the destruction of the Jewish Temple, and Axum is reputed to be the second Jerusalem. Our visit in Axum includes: the Stele Square, Kaleba Tombs, the 4th century Christian inscription of King Ezana, Queen of Sheba’s Palace, Archaeological Museum, and Tsion Mariam Church where the original Ark of the Covenant is said to be housed. After having breakfast at the hotel, transfer to Axum Airport for your flight to Lalibela. 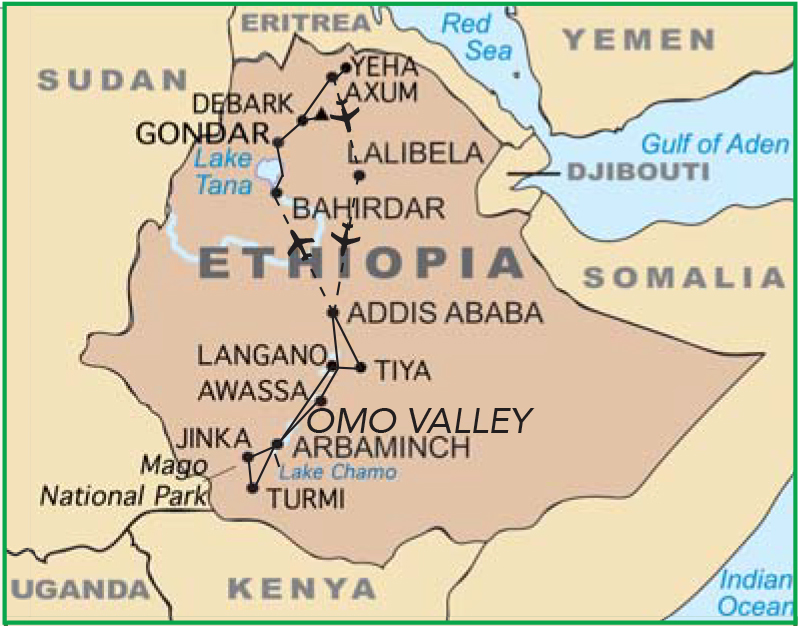 After check in, we will drive to the site where we find a concentration of some of Ethiopia’s most famous rock-hewn churches, mostly referred to by many as “the living wonders of the world.” These churches are, and they have been for at least 800 years, active Christian shrines, the spiritual center of the country’s religious life. The monolithic churches were carved out of 8,530 square feet natural rock terrace in the 12th-century AD by King Lalibela. Bete Medhani Alem, the largest monolithic rock-hewn church in the world, measures 37.7 ft. in height, covers an area of almost 2625 square ft and has walls that are up to six feet thick. A plain building supported by 36 pillars on the inside and another 36 pillars around the outside, Bete Medhani Alem was modeled on the original St. Mary Zion Church built in Axum by King Ezana during the 4th century. The rock-hewn churches that we will visit today include: Bete Medhani Alem, Bete Mariam, Bete Meskel, Bete Denagil, Bete Golgotha Michael and Bete Giorgis. Our guide will arrange for helpers and/or mules to assist us as we navigate the steps and pathways. Ride a mule if you wish. In the morning, have a mule ride, and trek to the top of Asheten Mariam Monastery. The famous 12th-century monastery church located at 10,298 ft above sea level provides a beautiful view towards Axum. We will trek/mule ride through dramatic highland scenery, which eventually ends in a beautiful serene agricultural hamlet. After having lunch and rest at the hotel, we will continue our journey into Ethiopia’s long and marvelous past with a visit to other St. Lalibela’s remarkable churches. Their architecture and artistry must be seen to be believed. Once we finish visiting the second group of churches we will walk to the village through the complex and bewildering labyrinth of underground tunnels to the monastery where the monks and nuns live. The rock-hewn churches that we will visit this afternoon include: Bete Gebriel, Bete Mercorios, Bete Amanuel, Bethlehem and Bete Aba Libanos. Early in the morning, we will witness one of the most colorful festivals - Meskel. The faithful will come to the Demera to share the blessing and to dance and sing around the bonfire. This ceremony is performed colorfully by priests and deacons with drums and sitars with a capacity crowd in front of the first group of rock-hewn churches. After breakfast, transfer to Lalibela airport for the flight to Addis Ababa. After check in at the hotel, the rest of the day we will have city tour of Addis Ababa which includes the view of Addis Ababa from Entoto. We will also have the chance to walk around Piassa and Churchil Avenue for shopping. Note: Flight schedules always subject to change. In the morning, drive south of Addis Ababa on the Butajira Road to Langano en-route enjoying the stunning views and visiting Gurage Village and Tiya. At Tiya, you will visit the northern most example of a peculiar type of engraved, standing stelae which stretch across parts of southern Ethiopia. These stelae are believed to have been erected between the 12th and 14th centuries and are almost certainly grave markers. After an early breakfast, we will drive to Turmi visiting different cultural people and their villages including the Konso and the undulating landscape of the Konso area. The Konso are famous for their old and unique terracing and unusual engraved wooden statues of Konso grave markers. Between Konso and Turmi, you will have stops at the Tsemay near Weito River, the Bena at Keyafer and the Ari at Kako Village. In the morning, we will drive to Jinka en-route visiting different tribal villages including Ari and Bena. After having an early breakfast, we will drive from Jinka to Mursi Village. The Mursi, undoubtedly the most celebrated residents of South Omo are a distinctive group of pastoralists. The Mursi are best-known for their unique item of decoration - lip plates. Women of Mursi wear a circular clay plate on their lower lip and the bigger a women can wear, the greater her value when she gets married. After breakfast, we will have a boat cruise over Lake Chamo to see some of the largest African crocodiles, hippopotamus, and many beautiful aquatic birds including the lovely Kingfisher and African Fish Eagle. After breakfast, we will start driving north to Awassa en-route visiting different villages and some of the most beautiful Rift Valley Lakes. After spending part of the morning relaxing around the lake, we will continue driving north towards Addis Ababa with brief stops at different towns such as Mojo and Debrezeit. We suggest using the Ethiopian Airlines flight ET501 departing from Washington, IAD on January 17 at 11:00 AM that arrives in Addis Ababa (ADD), Ethiopia at 7:15 AM on January 18. In the morning, fly to Bahirdar. We have an arrival transfer then check in to our hotel. Enjoy a boat ride on Lake Tana to Ura Kidane Mihret and Zege Peninsula to witness one of the most colorful and undiluted Timkat Festivals (Epiphany). This is a unique and non-touristic experience. After breakfast at the hotel, we will drive 22 miles to visit the majestic Blue Nile Falls. Eighteen miles after it exits Lake Tana, the Blue Nile plunges over a 148 feet-high face to form one of the most spectacular waterfalls in Africa. Walking to the waterfalls through the beautiful river gorge on the ancient bridge from the 17th century, and meeting the local people at the small villages on the way is also a great experience. After an early breakfast, we will drive towards Axum through the Simien Mountains National park. When driving from Gondar up to Simien Mountains National Park, nothing prepares you for the spectacular scenery that awaits you at the top of the massif. The rolling grassy plateau comes to an abrupt stop, and sheer cliffs plunge almost vertically for 1,000 meters (3,280 feet) to the plains below. The massif itself has been sculpted by 30 million years of up thrust and erosion into a wonderland of jagged ridges, pinnacles and strangely cropped conical mountains, so that looking out over the heart-stopping precipice, you feel you might just be at the edge of the world! After breakfast, continue to Axum through the beautiful sceneries of the Simien Mountains, Limalimo and Tekeze River Gorge. After breakfast we will begin the visit of the ancient city of Axum. This is the birthplace of the Ethiopian civilization. By the first century, Axum was a major trading center for exotic goods from Egypt, Rome, Nubia, Greece, Syria, and India. It is believed that the Holy Ark of the Covenant was brought here before the destruction of the Jewish Temple, and Axum is reputed to be the second Jerusalem. After breakfast at the hotel we transfer to Axum Airport for our flight to Lalibela. After check in, we will drive to the site where we find a concentration of some of Ethiopia’s most famous rock-hewn churches, mostly referred to by many as “the living wonders of the world”. These churches are, and they have been for at least 800 years, active Christian shrines, the spiritual center of the country’s religious life. The monolithic churches were carved out of 8,530 square feet of natural rock terrace in the 12th-century AD by King Lalibela. Bete Medhani Alem, the largest monolithic rock-hewn church in the world, measures 37.7 feet in height, covers an area of almost 2,625 square feet and has walls that are up to six feet thick. A plain building supported by 36 pillars on the inside and another 36 pillars around the outside, Bete Medhani Alem was modeled on the original St. Mary Zion Church built in Axum by King Ezana during the 4th century. After breakfast we will drive to the Tabot Madeira where the replica of the Ark of the Covenant will be rested overnight. The following day the Ark will be transported to Bete Giorgis accompanied by feasting, singing and dancing. When the Tabot reaches the church, there will be dancing by the priest along the cliff edge of the church while the faithful continue to dance forming different smaller groups. After having lunch and rest at the hotel, we will continue our journey into Ethiopia’s long and marvelous past with a visit to other remarkable churches of St. Lalibela. Their architecture and artistry must be seen to be believed. Once we finish visiting the second group of churches we will walk to the village through the complex and bewildering labyrinth of underground tunnels to the monastery where the monks and nuns live.